Even today, that song remains one the most popular song from that era. And as you can now imagine, I have been dreaming of visiting these beautiful gardens forever. Finally this year, we made the trip to Holland, especially for the Tulips. It was still early spring but most of the blossoms were in full bloom. But no matter how many pictures you see online, nothing compares to the feeling of walking into Keukenhof Gardens for the very first time. We managed to leave as early as possible from our hotel, made our way to Schiphol airport/railway station and took the shuttle to the gardens. 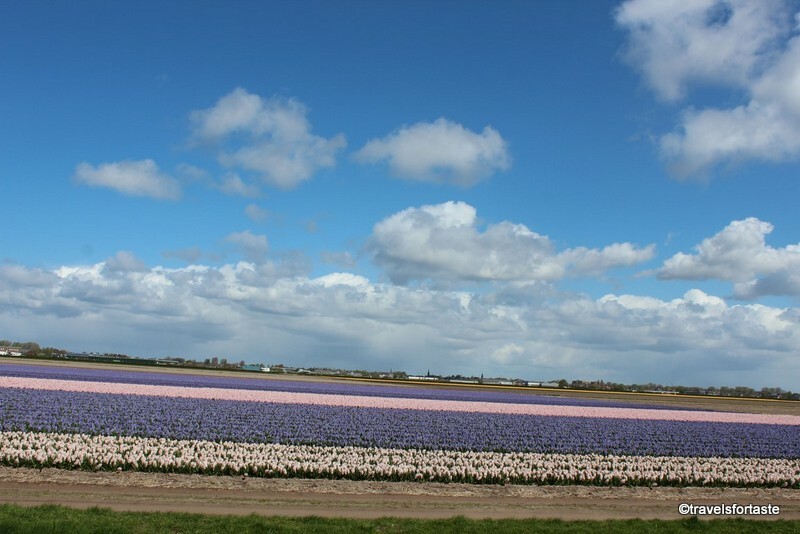 A quick 30 minute journey and you will be at Lisse, where the garden is located. 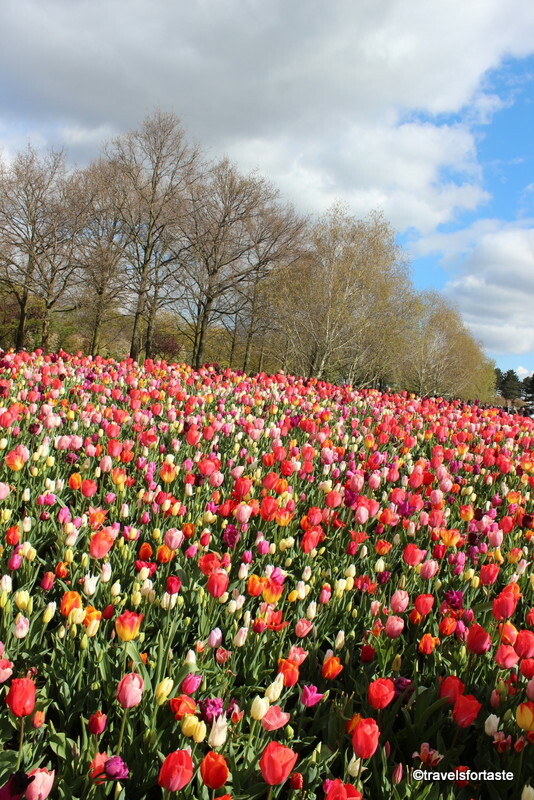 When you are about to approach the gardens, you will be greeted by huge fields of tulips in all possible colours, we saw stunning shades of lavender and cream and rows and rows of bright red and yellow tulips. I was a bit apprehensive when I saw a large number of tourist buses parked outside, but it was peak season for the tulips and a bank holiday weekend so crowds were to be expected. Once inside we were greeted by friendly staff and handed a handy free map of the gardens. 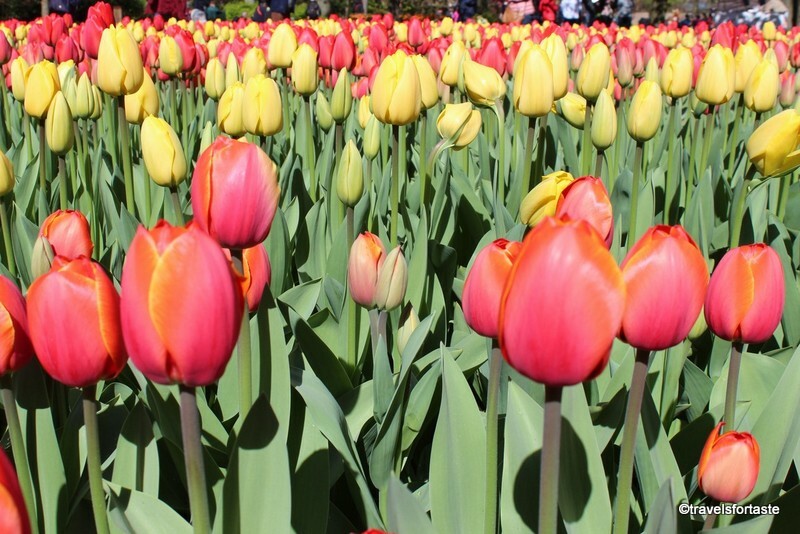 The worlds largest spring flower garden which is home to a mind boggling variety of tulips was originally a kitchen garden! Dating back to the 15th century, this was once home to a Bavarian countess whose kitchen was supplied by produce from these gardens. 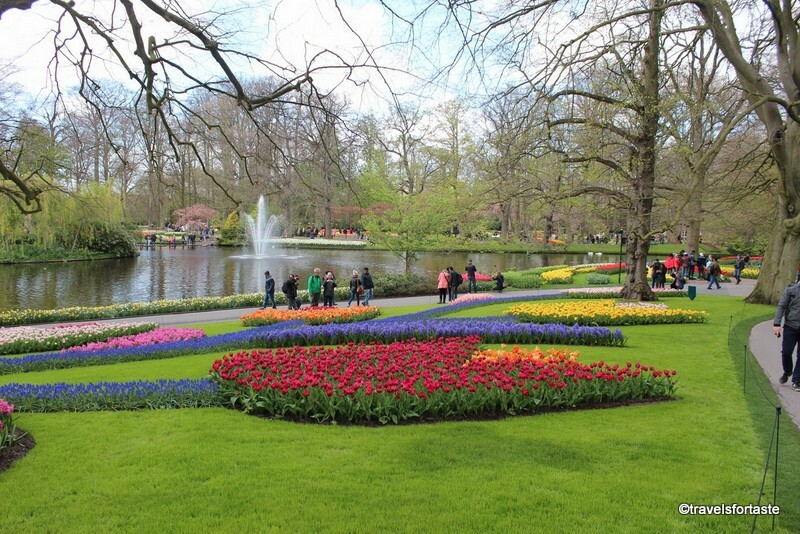 Hence, the name – Keukenhof which in literal translation means kitchen garden. 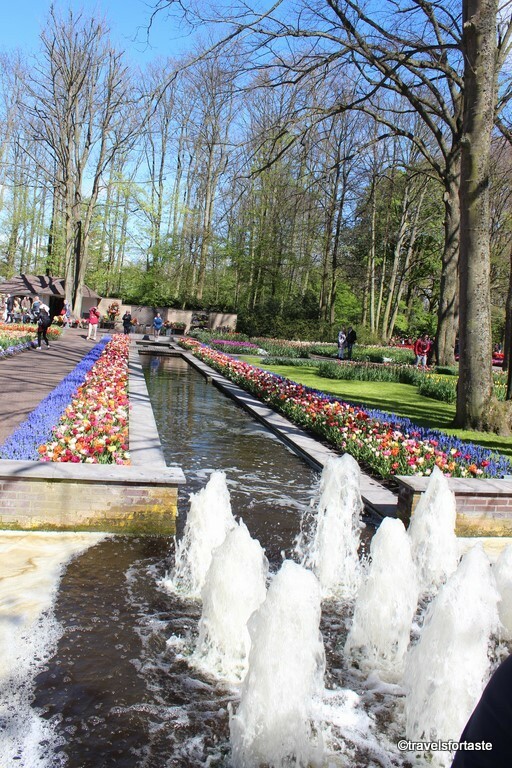 After being passed on from the Dutch noble family, in the 16th century, an admiral took over the estate and built the Keukenhof Castle in 1641. In the 19th century, landscape architects Jan David Zocher and his son, famous for their work at Amsterdamn Vondel park re-designed the castle grounds to what we see today. 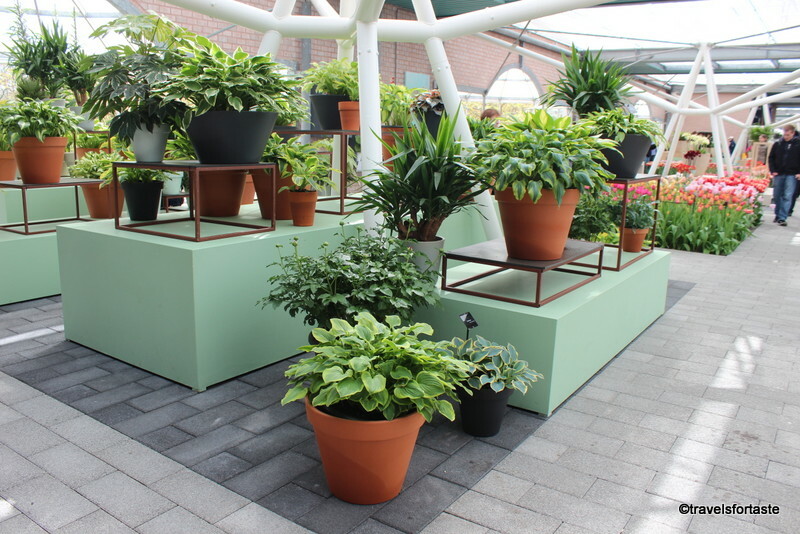 Later in 1949, the then mayor of Lisse, threw open the gardens to floricultural commerce and even today more than 500 exhibitors showcase their plants, bulbs and blossoms in over 20 shows. 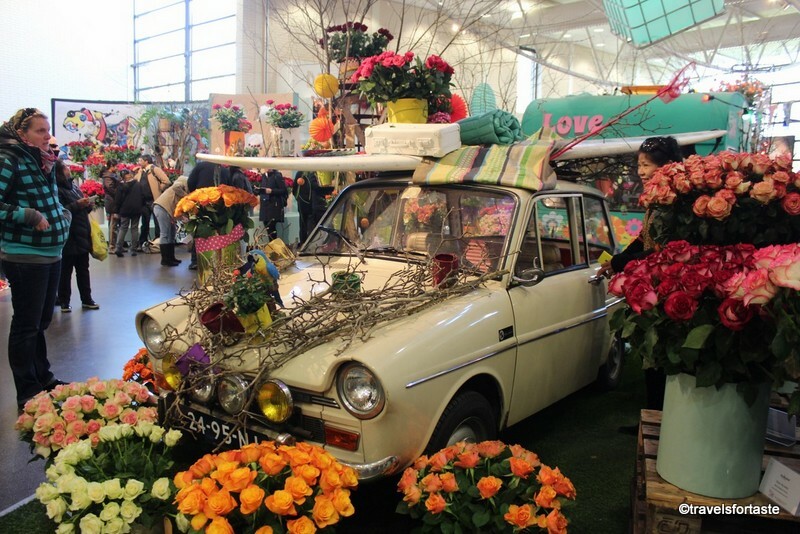 So do make sure you don’t miss out on the custom made floral displays and do go and see the indoor exhibits. 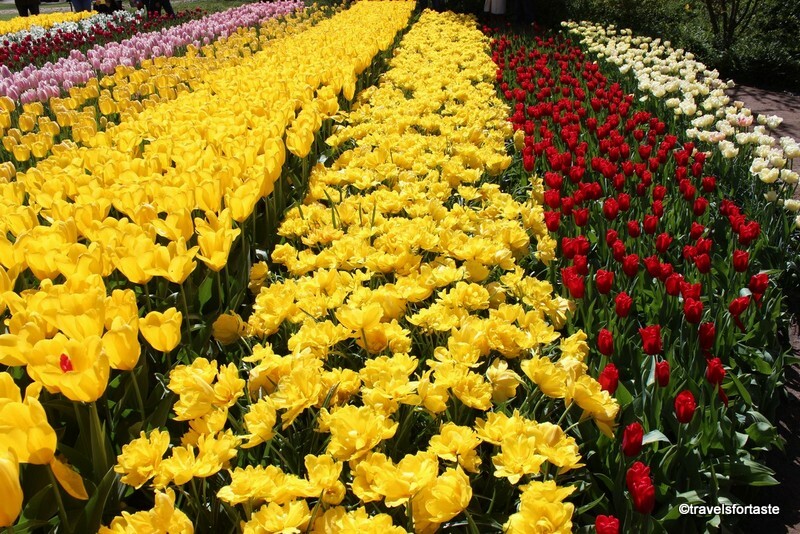 Be prepared to feast your eyes on not just tulips but stunning roses and a huge variety of flowers and potted plants. Millions of spring blooms that grace these gardens give picture postcard perfect opportunities for budding photographers. Though the best time to visit the gardens is mid- April, when we did, over the Easter break, the garden is open to the public from March end to mid-May. 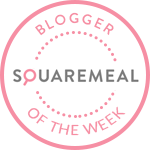 Because the gardens are massive it is essential you chalk out a route for yourself and it is possible to walk through the whole garden in a few hours while packing in a quick lunch. That is, of course, possible if you do not linger around too much at any one spot – or you could if you like walk around and pick a favourite spot (like the one below) and spend some quality time there admiring the blooms and the grounds. 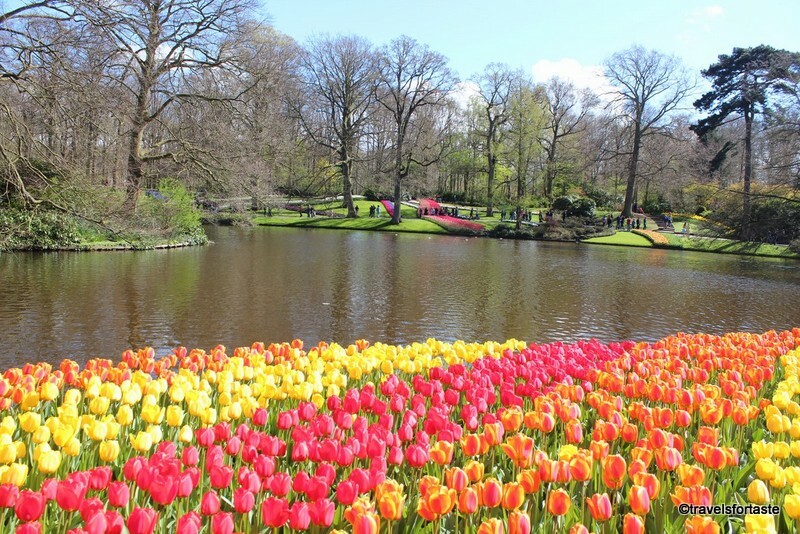 Keukenhof is located at Lisse in Netherlands, a 30-minute bus-journey from Amsterdam. There is a bus leaving every 15 minutes from Schiphol airport to the garden. There are good transport links from all the major cities of the Hague, Haarlem and Leiden. 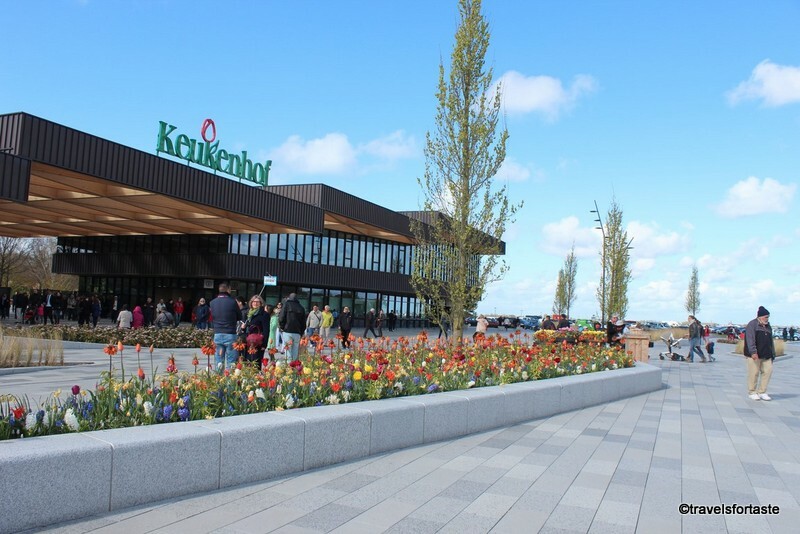 Hoofddorp is a popular tourist location to stay during peak season too with loads of hotels in the town with regular shuttle services to Schiphol. 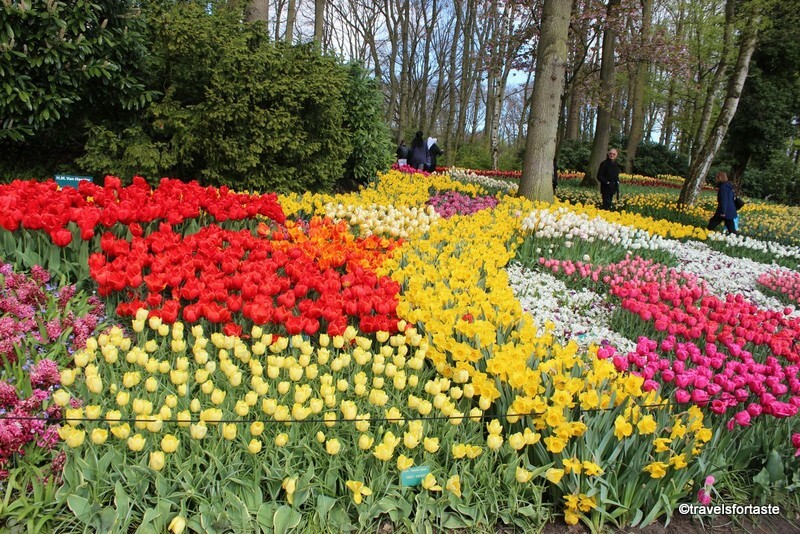 Top 5 tips to make the most of your visit to Keukenhof Garden, Holland. 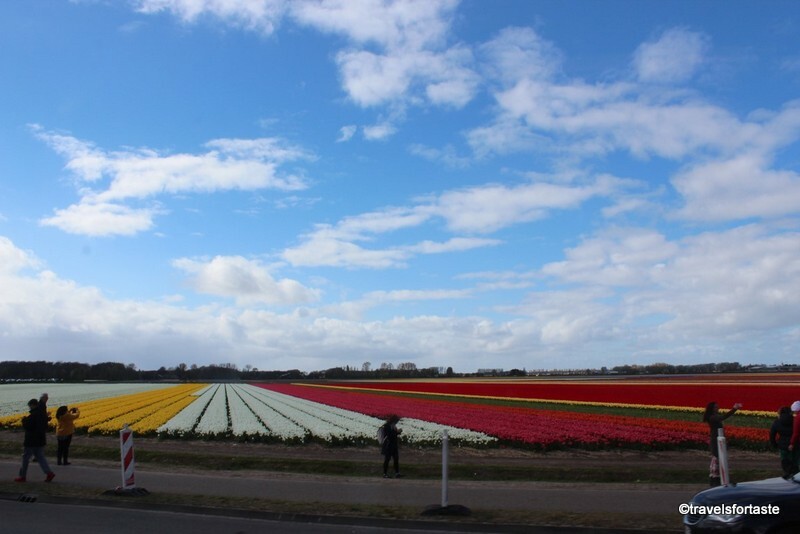 Photo-blog of the Graden of Europe and Tulip fields. Top 5 travel and stay tips to plan your visit to Amsterdam. Cheese and wine tasting at Reypenaer Amsterdam. 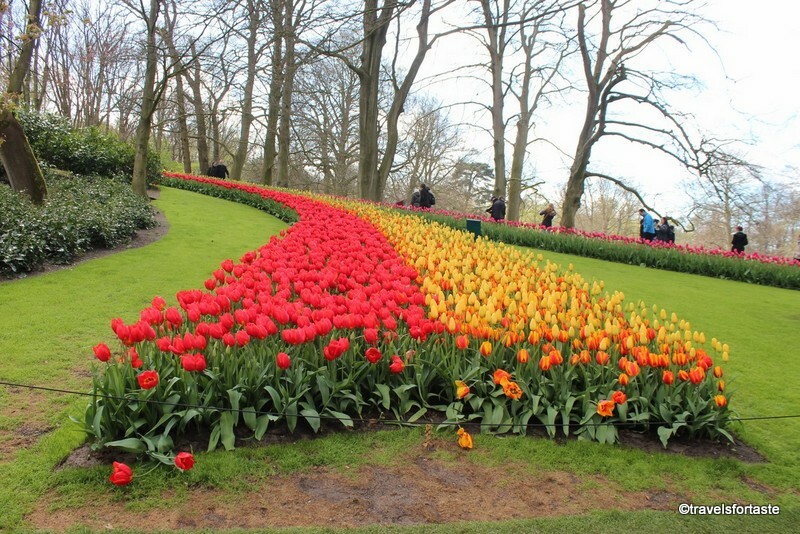 *With thanks to Visit Holland for our tickets to view this stunning Tulip garden. *All opinions expressed are as always my own. 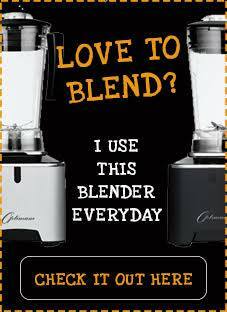 No monetary compensation was provided for a positive review. Those tulips are absolutely gorgeous! If I’m ever in the area, I have to stop by and check these out. great pics! Thanks Danielle, I can’t stop looking at the photos over and over myself! 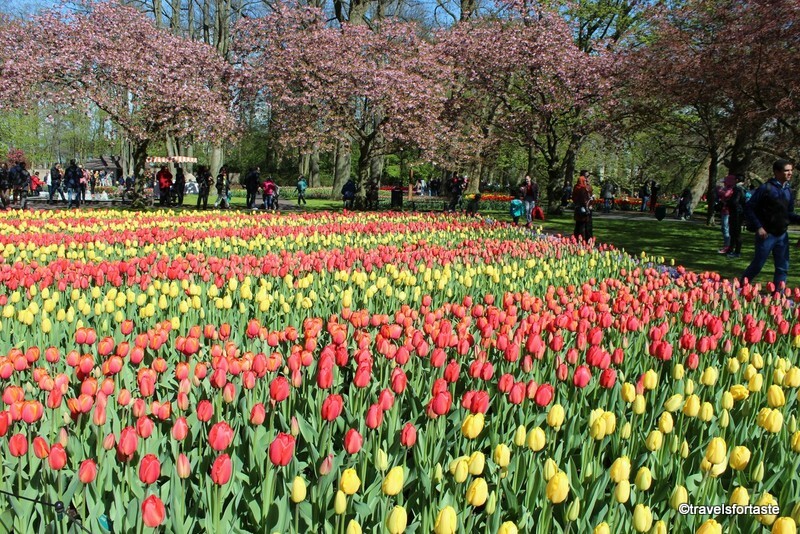 Yes you absolutely must go and see the Tulips for yourself when you are in the Nethrlands! I didn’t get to see any floating flower markets, hope on my next trip to Amsterdam I will ! Oh wow what a lovely trip you had! Brilliant photos too. Thanks Janice, it was a very memorable trip and great to finally live out a dream I had for so many years! Major tick off my wish list! 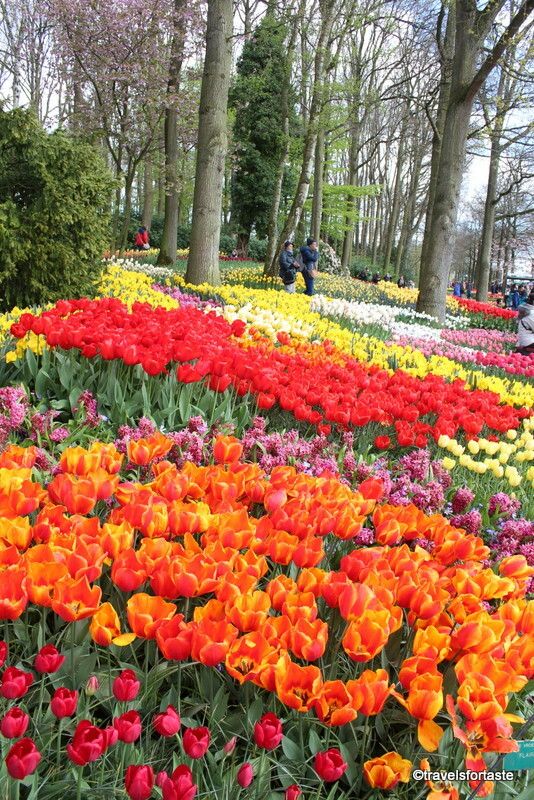 These tulip gardens are so very pretty. I am almost expecting you to be dancing through with Mr C Bollywood style. 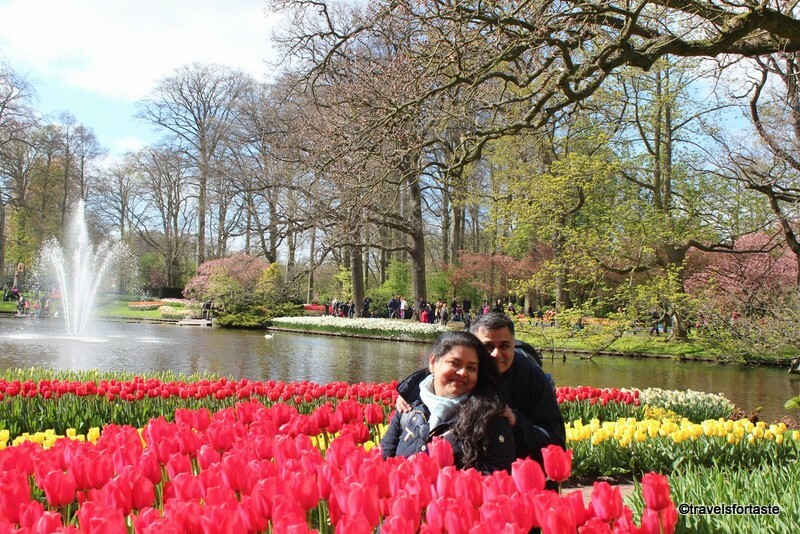 Thanks Nayna, hahha yes would love to dance with OH – Mr.K in those Tulip fields! Oh my goodness, they are absolutely stunning. I love all flowers and tulips are so beautiful, I really must visit. Yes they truly are stunning, Tulips are so beautiful and the sheer variety of colours is bound to amaze anyone! These gardens are so beautiful – and sadly we missed them on our visit. The best excuse to go back huh? Wow what an incredible colours. It looks like a dream! I’d love to visit, it’s just beautiful and tulips are my favourite flower. This is going on my list. Shared! It looks absolutely magical! Such vivid colours. I’d love to go back to the Netherlands soon. What stunning photographs! I’d love to visit. That garden is so beautiful! I can’t believe how vibrant all of the colors are. I bet it smelled amazing! Wow those tulips are absolutely beautiful!